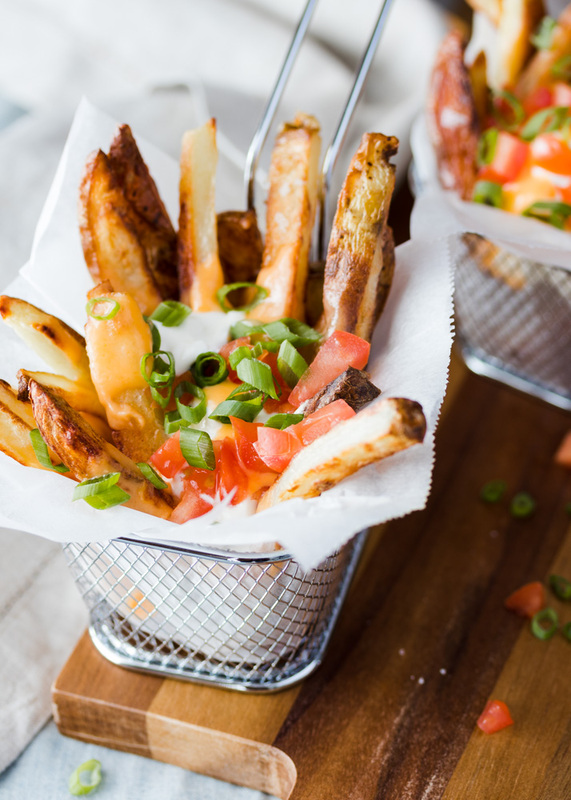 We’ve got a Copycat New York Fries Veggie Works to knock your socks off today! It’s pure comfort food, and pretty much the perfect food for a night of Netflix and chilling. The best part? The fries are oven-baked, and the cheese sauce is homemade, which means they are healthier than the original as well! Ah, New York Fries Veggie Works. For the uninitiated, it’s basically the best thing to enjoy while watching a movie. You see, Nicole and I used to live in St. John’s, and we were more of of the sort to watch movies on Friday nights than go downtown. Not that we don’t love downtown, but the Avalon Mall theatre was a magicial place for a poor university student. You could get supper and a whole night’s entertainment for less than $20, plus it was within walking distance to our apartment. Just the cab alone would cost that much if we went downtown! In fact, Nicole loved it so much at the theatre, she started working there. With her employee discount, it’s safe to say we enjoyed quite a few movies with the Veggie Works from New York Fries. Alas, those days are no longer. Even if we still lived in St. John’s, the Cineplex takeover means no more cheap food and no more New York Fries in the theatre. So we set out to make some ourselves! 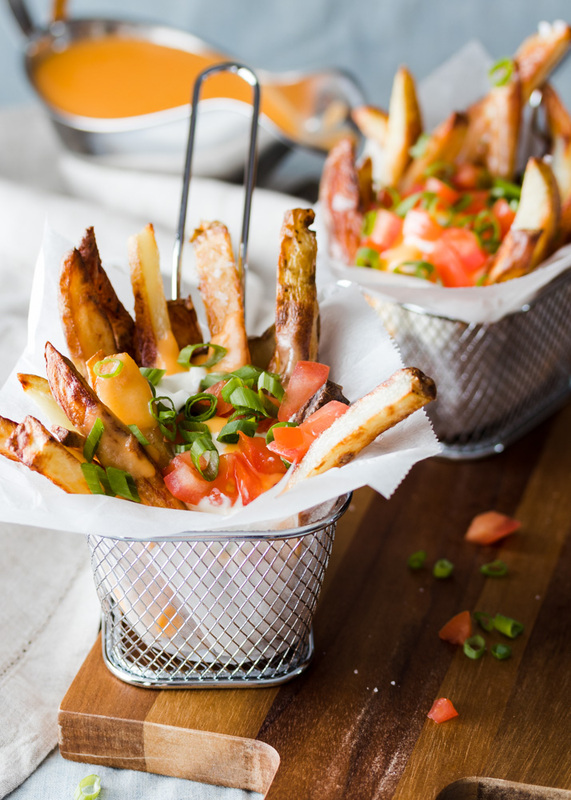 Behold, the winning combination of skin-on crispy fries, spicy cheddar cheese sauce, rich sour cream, juicy tomatoes and fresh, fragrant scallions. How did we create such perfection you ask? Well, we basically followed the same old technique we always do for oven fries, and used mom’s cheese sauce recipe that she has always made for broccoli. As it turns out, sometimes the old ways are the best. As a bonus, these are so easy to knock off on a Friday night when you just wanna kick your feet up and watch a movie. The cheese sauce is made in the microwave, fer chrissakes! In all seriousness though, we hope you enjoy our version – we certainly did! And if you give them a try, let us know your thoughts in the comments below! A slightly healthier but just as tasty spin on the classic from the fast food chain. We use 2 baking sheets, as it’s important not to crowd the pan for crispy oven fries. Preheat the oven to 400F. Slice the potatoes into french fries shapes, roughly 1 cm thick. Transfer the fries into a bowl of cold water as you work, and let sit several minutes to remove some of the excess starch from the outside. Once complete, drain the fries and dry them completely with a tea towel. Dry the bowl they were in, and transfer the fries back, tossing them with 2 tbsp oil and the cornstarch, until all fries are evenly coated. Prepare 2 baking sheets by adding 2 tbsp oil in the bottom of the pan and preheating the oiled sheets in the oven for a minute or two. Divide the potatoes evenly between both sheets, being sure not to crowd. Bake on 400 for 15 minutes, before removing and turning with a metal spatula, then turn up the heat to 425F and baking for an additional 15-20 minutes or until nicely golden and crispy. While the fries are baking, prep the cheese sauce. In a microwave safe bowl, melt 2 tbsp butter and add the flour. Return the mixture to the microwave and cook for 30 second intervals, stirring with a fork until the mixture bubbles up and forms the base of a roux (about 2-3 times). When ready, slowly whisk in the milk, stirring very well to incorporate fully with no lumps. Continue to microwave the mixture at 30 second intervals with stirring in between until the mixture is thick enough to coat the back of a spoon. At this point, add the cheese and stir well until the cheese is melted and the sauce is smooth. You may need to microwave for an extra 30 seconds if the cheese doesn’t completely melt. Once complete, add the hot sauce and stir well. 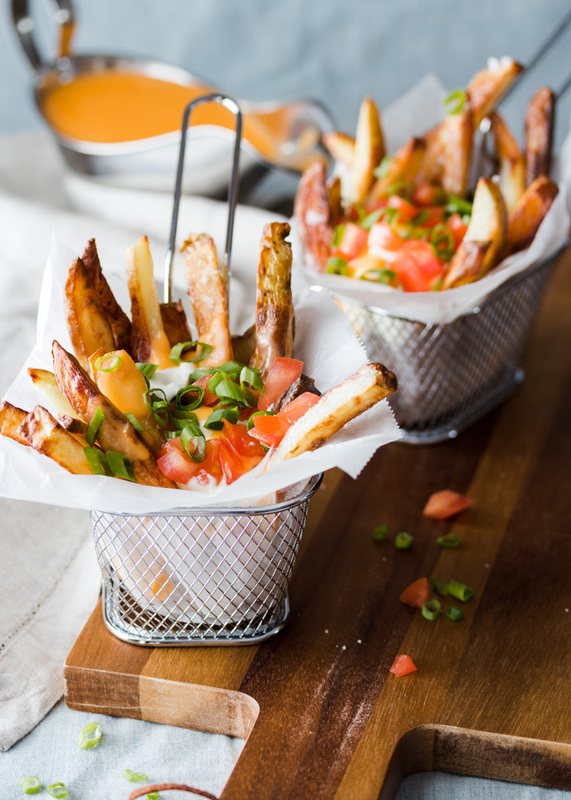 To assemble the fries, divide into servings and top each with a good drizzle of cheese sauce, a large dollop of sour cream, followed by tomatoes, then green onions on top. Serve immediately.